Speaking shortly this are sites that are known to human moderators for beeing good and having decent quality.Seobook says Good pages rarely link to bad ones. Bad pages often link to good ones in an attempt to improve hub scores, The care with which people add links to a page is often inversely proportional to the number of links on the page, Trust score is attenuated as it passes from site to site. So even if page has good PageRank still TrustRank may not be as high. Especially that PR changes all tiem and we see it only on updates. The main thing is – nobody really knows sites TrustRank rating. Even if site has PageRank7 it doesnt mean it has big trust rank, the main sites we coudl think of are Wikipedia, Cnn etc sites. SO shortly – spots where we will never place links on. Main TrustRank benefit is that if you get link from site with such high results it will cont more than even high pagerank link from other resource with smaller TR result. Back i nthe days .gov and .edu sites had great TR so all viagra spammers were using those – but this changed. Now .edu and .gov have many filters, for too many of them you can get sandboxed. I wont paste here my sales copy but i will say straight – websites made on those rank for competitive terms and they are great for 2nd tier of links. 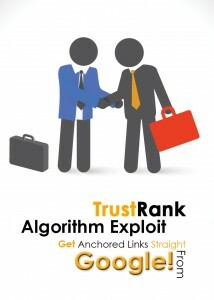 They are very powerful and 100% google trusted links that nobody would think of or consider using. Get the ebook here. This entry was posted in High Page Rank Sites and tagged ebooks, free backlinks, googlebot, greyhat seo, how to index site, Spamming Links, whitehat linking, whitehat seo by iglow. Bookmark the permalink. sales closed. hope all of you enjoyed the method whe ni t was for sale.